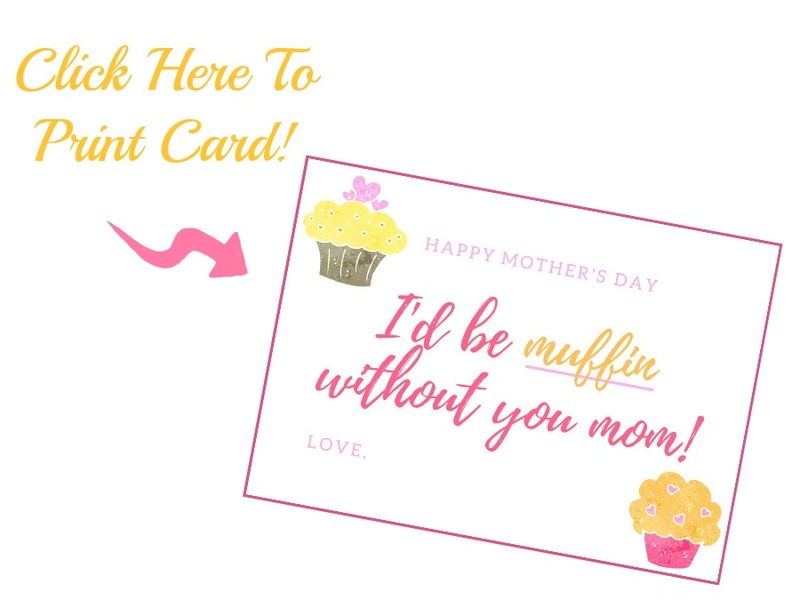 Free Printable Mother's Day Card and Gift Idea - I'd Be Muffin Without You! A big thanks to Entenmann’s® Little Bites® for the coupons and gift card! 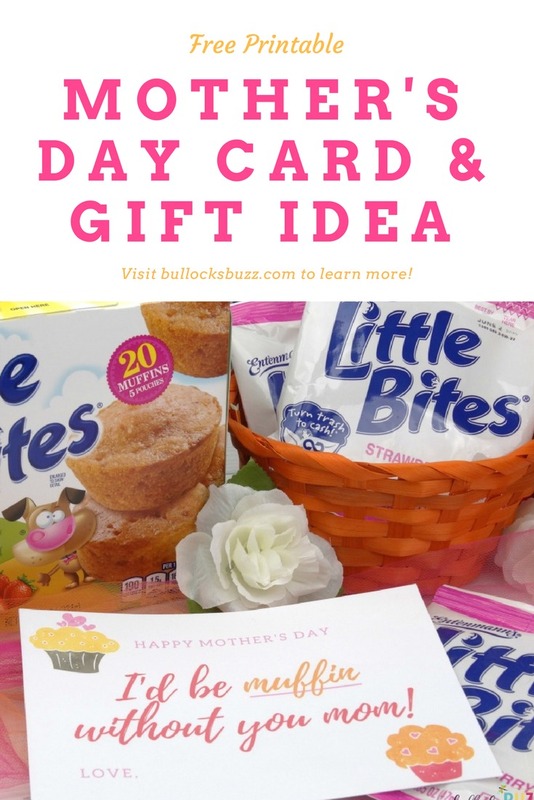 Today’s post featuring a free printable Mother’s Day Card and gift idea is a sponsored post on behalf of Entenmann’s® Little Bites®. When Mother’s Day came rolling around, I used to always be at a loss of what to get my mom. Then I became a (step) mom myself, and it dawned on me. What it really comes down to is my family simply saying how much I mean to them. A simple ‘thank you’ or ‘I love you’ means the world to me! You know, moms are simply amazing! If it wasn’t for my mom and all she did for me and all I learned from her, I’d not be who I am today. So this year I decided to make my mom a simple, yet funny card to go along with an extra special sweet treat to let her know exactly how much she means to me. I absolutely loved the way this card turned out! Pair it with either a basket full of homemade muffins or several packages of Entenmann’s Little Bites, and you’ve got a perfectly sweet Mother’s Day gift! And, since I couldn’t keep this sweet little card and gift idea to myself, I thought I’d share it with you too! I made it super easy for you to print it out and cut to make a 7 x 5 Mother’s Day card for mom. To download the printable Mother’s Day card, simply click on the link in the previous sentence or click the image below, print it out, and sign it. To go along with the card I made this adorable Mother’s Day gift. It could not be more simple. 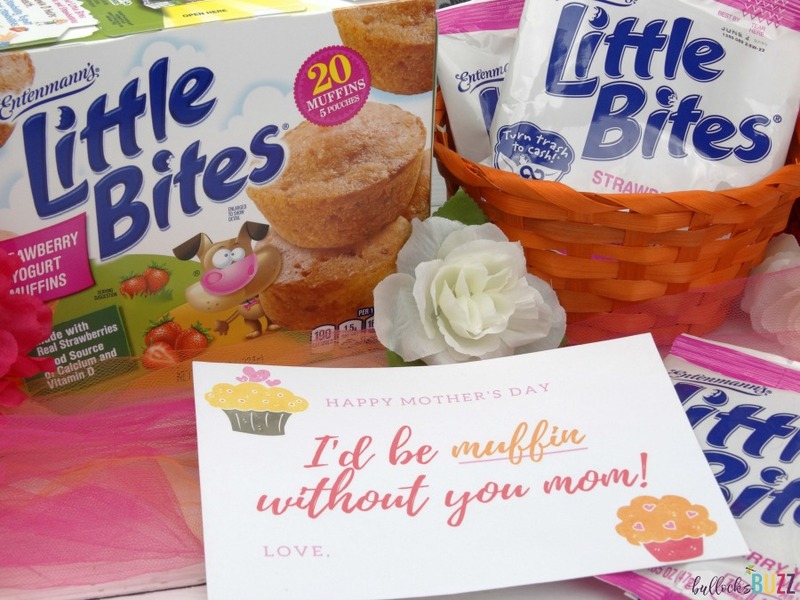 All you need is a basket, a flower, a few packages of Entenmann’s® Little Bites® Strawberry Yogurt Muffins and one of my free printable Mother’s Day cards! Plus, it’d be the perfect way to present her with a super nice gift card – perhaps even a gift card to a spa (giveaways below, so keep reading)! 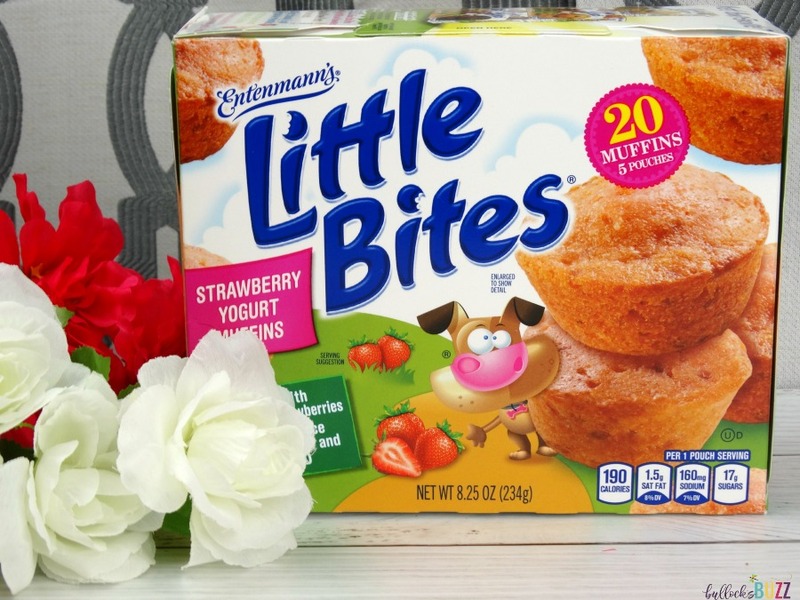 Just in time for strawberry season and Mother’s Day, Entenmann’s® Little Bites® Strawberry Yogurt muffins are back! 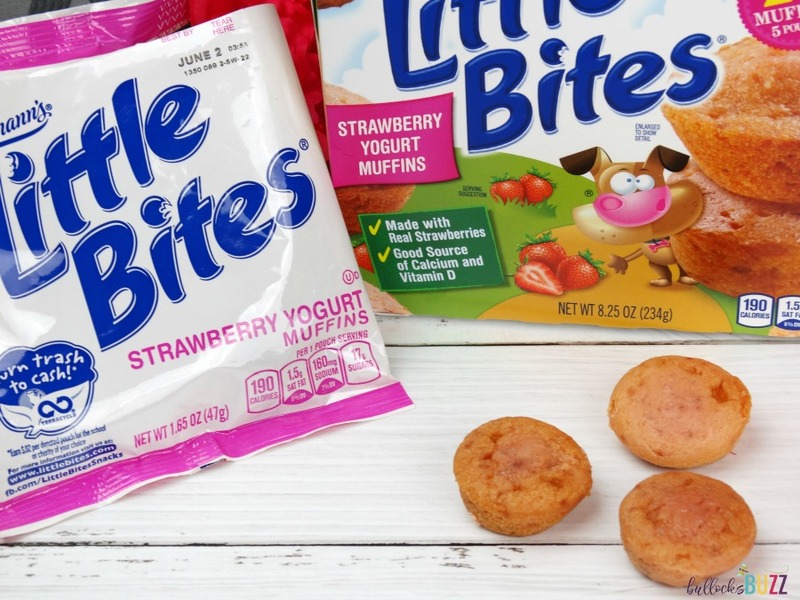 These tasty little muffins are made with a light, delicious blend of real strawberries and creamy yogurt. They’re super moist and packed full of strawberry goodness! In fact, they are so good it’s hard to believe they have less than 200 calories per pouch! Plus they are a good source of calcium and vitamin D, and do not contain any high fructose corn syrup or trans-fat! Best of all, they come in these perfectly portioned pouches that are ideal for on-the-go snacking or breakfast. My family loves almost every flavor of Entenmann’s® Little Bites® muffins! From their Blueberry Muffins to the seasonal Little Bites® Cookies & Crème flavored muffins, they are all so good! However, I do believe my favorite are these limited edition Strawberry Yogurt Muffins! Remember that giveaway I mentioned above? The one that’d pair perfectly with the printable Mother’s Day card and gift basket? Guess what? I have not one, but TWO awesome giveaways to share with you today! First of all, Entenmann’s® Little Bites® is thanking moms for all that they do by giving away five $100 spa gift cards! Yes! Entering is a breeze! Simply visit https://www.littlebites.com/mothersday and enter for a chance to win this special treat for yourself or your mom! This giveaway ends soon so hurry and enter! And to make things even sweeter, the great people people at Entenmann’s® are also giving away (3) $5 off Coupons for any Entenmann’s® Little Bites® AND a $25 Visa Digital Gift Card to one lucky Bullock’s Buzz reader! Hooray! To enter, use the Giveaway Tools form below. This giveaway is open to US residents only. Giveaway will end at 12am CST on Monday, May 17, 2018. Good luck! I love the banana little bites. I like the blueberry Little Bites! Nothing better then Entenmann’s Little Bites Fudge Brownies! I like the party cake ones. I usually come back to either snickerdoodle flavor or the Little Bites brownies. But, I love strawberry anything, and I haven’t tried the strawberry muffins yet. Well it was crumb cake, but strawberry is my favorite anything so this might just win. My favorites are the Little Bites Fudge Brownies! My family and I love the blueberry Little Bites.